This fabulous set was designed by Eugene Bertolli for Napier. It is titled "Wheat Chain" and is shown on page 264 of the book "The Napier Company - Defining 20th Century American Costume Jewelry" by Melinda L. Lewis. In the early 1940s Napier had the machinery made to manufacture this unique chain. In the 1950's Eugene Bertolli designed the pin and drop dangle earrings to go with the original necklace and bracelet. The chaining on these pieces is very flexible and moves as you do. The brooch measures 3" across and 3-1/4" long. The matching earrings dangle1-7/8" long. 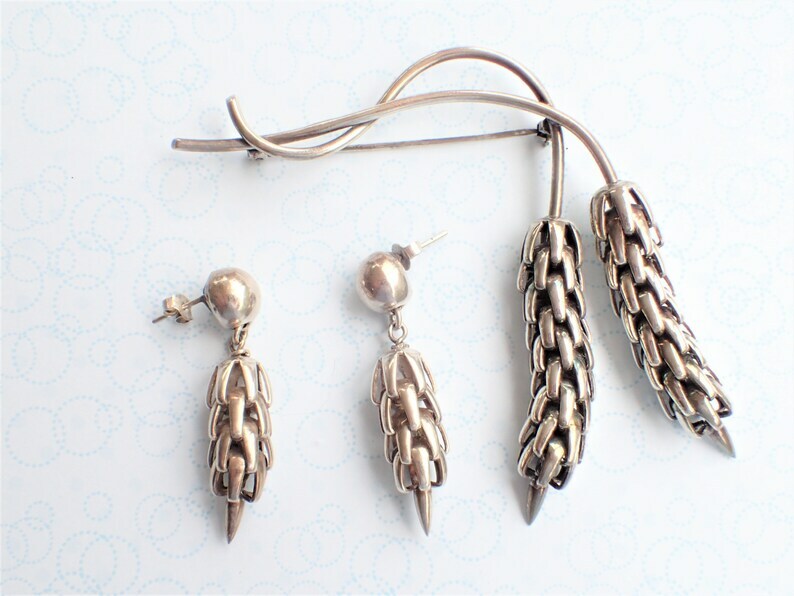 The earrings were created as clip ons but the original owner had them converted to pierced post to make them more wearable for today's fashionista. The set is in very good condition with no wear to the silver plating and no dents or dings to the unique chaining.